Not one person had actually even mentioned autism up to that point. The debate centered around efficacy vs. potential side effects of vaccines, but autism wasn’t one of the ‘side effects’ named. But this person felt the need to make an assumption, and then use emotive rhetoric to shame everyone on the thread. This is not the only time I have seen this lately. In fact, in groups that are not about vaccines and have a mix of people who are both for and against them, pretty much any time the topic comes up, things happen this way. People go back and forth, talking about the risks of disease, vs. the risks of vaccines (typically, discussing the possibility of severe allergies, autoimmune issues, learning disabilities, death, as well as the corruption surrounding vaccines). Then, someone pops into the thread and ignores all of the information that has been shared, and turns it into a “you anti-vaxxers hate autistic people” tirade. When no one said ‘autism’ up to that point. This is the fault of the neurodiversity movement, and it’s frankly the most successful and damaging piece of propaganda yet. When the medical industry couldn’t convince parents to keep vaccinating by parroting “Vaccines and safe and effective, the end!” they decided to try emotional manipulation instead. First it was “Vaccines don’t cause autism!” But with thousands of stories of kids who had been developing typically and then regressed into ‘autism,’ they didn’t get very far with that. Then it was “Anti-vaxxers are stupid and prefer dead children!” Most people didn’t buy that, either, seeing as people who are more educated are less likely to vaccinate, and we’re not exactly seeing unvaccinated children dying in droves (or hardly at all). Then, in our post-PC culture that is extremely aware of peoples’ rights and protections, they decided to equate what used to be called Asperger’s or “high functioning autism” with severe, regressive “autism” and claim that it’s genetic, people are born with it, and that anyone who doesn’t fully accept them as they are, is a hateful bigot. That view is unique in terms of our societal approach to disability or dysfunction in any sense. With just about everything else, we acknowledge that people who have a disability are worthy, valuable humans who need extra understanding and support, but that we’d also like to prevent others from having the same experience, if possible. We value people who have cerebral palsy as individuals, and see them as ‘differently abled,’ but we still try to prevent birth injuries that cause CP. We value people who have spina bifida as individuals, but we still tell pregnant women to supplement with folate in order to prevent it, and related neural tube defects. We value people who are deaf, but we still try to prevent non-congenital forms of deafness. Wanting to keep others from having to struggle or having trouble getting along in a society that isn’t designed for them, for whatever reason, is usually seen as good and moral. We would consider it bad to deny pregnant women adequate folate on purpose, because they should be willing to accept their child with or without spina bidifa, because it’s just who they are and it’s all the same. If someone’s situation leads to them needing extra support and makes aspects of life more challenging for them, we’re supposed to want to help them, and want to prevent others from needing the same. In the early 2000s, this is why all the therapists and experts carefully taught us to say that someone was “a person with autism” to separate the person from the disability. Valuable person; needing support. The fury over autism alone doesn’t make any sense at all. Of course, “autism” as the mainstream discusses it, and “autism” as vaccine injury are not the same thing anyway! Some people are born with different brain function, that causes them to relate to the world in a unique way. That’s great. I believe that that is true for several people, particularly adults who are leading relatively independent lives and can participate in this discussion. But that is not everyone’s reality. Some children were born healthy, and were developing typically. They showed no signs of being “different” in any way. Until they were given certain vaccines…and then, parents report, they changed overnight. They stopped making eye contact, they stated screaming in a high-pitched voice, they banged their heads, they stopped speaking, they stopped walking. This isn’t autism. It’s not the autism that people are born with, that causes different but valid functioning. This is neurological injury. This was caused by the doctors, and caused by the vaccines. Not all vaccine injury looks like this. Some people, following vaccines, develop chronic pain. Some develop several new food allergies, or environmental allergies. Some don’t lose speech, but their speech becomes unintelligible. Some develop autoimmune conditions. There are many, many different forms of vaccine injury. Vaccine injury doesn’t just happen to babies. It can happen to toddlers, to older children, to teens, to adults. I personally know several people who were injured by vaccines, and at different ages. None of them have autism. When we try to pretend that neurodiversity autism is the same as vaccine injury, we erase the voices of all of those families who are struggling with health conditions that are directly related to vaccines. THEY EXIST. THEY DESERVE TO BE HEARD. And yes, I am shouting that. Because I’m sick and tired of their voices being erased because it’s not convenient for some people. This rhetoric has done what all the science and “hate those stupid anti-vaxxers” propaganda couldn’t: stopped some people from actually questioning vaccines at all. If someone who is unfamiliar with the entire discussion asks a question about vaccines, and they’re met with fury and are told that only those who hate autistic people would even ask, and that they need to stop being a bigot, then two things will happen. First, the social shame heaped upon them will make them stop discussing the topic immediately. Second, the utter distraction from the actual issue will confuse them. They’re less likely to ever question vaccines again, and certainly won’t bring them up in public — unless they ever find a sympathetic ear. They will do anything to get people to stop asking questions about vaccines. Even if doing so causes harm to many people physically, emotionally, and socially. They don’t care. It is entirely reasonable to ask, “What does this vaccine do? How does it work? Are there any side effects to it? Are there any situations in which it could be dangerous for me or my child?” Those are questions that intelligent, thinking people should ask about anything before accepting it. They want us to ask more questions about using ginger root or lavender essential oil (two extremely safe natural remedies with a long history of use and almost no side effects) than they do about vaccines. Does this make any sense? Of course not. This is all a warped worldview, intended to make us do what we’re told. Stop thinking for ourselves. Just don’t ask any questions…. I won’t be silenced and I won’t allow families who are dealing with vaccine injury to be silenced, either. Their injuries are not neurodiverse autism. And their efforts to support and heal their children are not the “child abuse” that some of these people have suggested that it is. Wanting to prevent something that negatively affects someone’s functioning is good and right. Wanting to offer someone support to restore normal functioning is loving. Listening to the child’s own communication, where possible (some aren’t able) and helping them in the way that they request is important. Vaccine injury is not going to stop. Not as long as we keep adding more and more vaccines to the schedule and keep trying to pass more laws to force people to accept them. But “the people” aren’t going to put up with this. We are going to keep speaking out, keep sharing stories, keep fighting for everyone to know the truth. If you or your child was injured by a vaccine, please share your story in the comments. Anyone who is commenting just to attack these families or who is perpetuating the anti-vaccine-injured hate will be deleted. Has vaccine injury happened to you? Please share your story! My daughter has apraxia of speech (CAS). The video we shot of her before her shots (around two weeks before) and after (about three weeks) show a definite decline in her ability to manipulate her Speech motor skills. We did this to her! Now we are fighting hard to work around the ‘accident’ in her brain. Our decision to vaccinate was based on that we were told it was universally safe, handed the CDC fact sheet in the doctors office and we knew no injured kids. I refuse to hide! It was absolutely those shots that caused this and I will tell anyone who will listen. 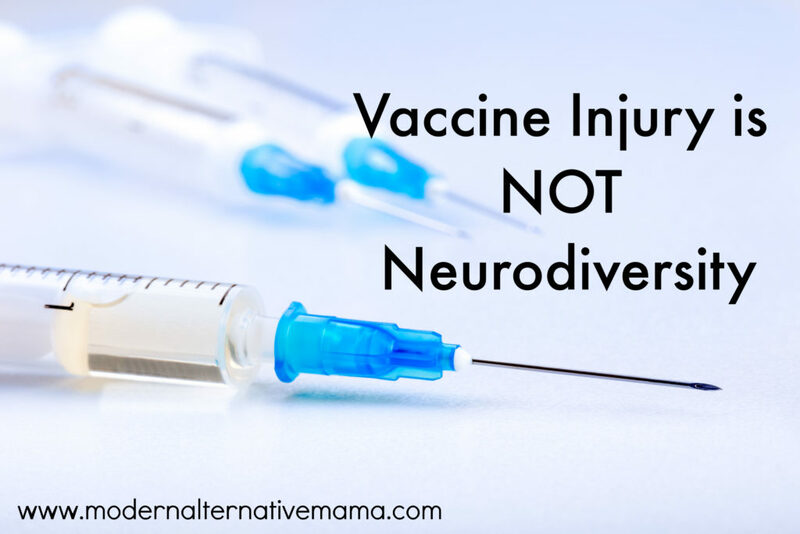 Thank you for distinguishing the difference between neurodiverse and vaccine injured! I’m in the group you’re speaking of, and saw the whole conversation. I totally get where you’re coming from for most of this article. I’ve been following you for years, and I remember how excited I was when I recognized your name there! First of all, I want to clarify that I don’t vaccinate my daughter or myself (husband is required to be UTD for his job), I prefer natural cures over medical whenever possible – I’m of the perspective that western medicine is good for acute conditions, but not chronic ones. However, I do want to clear up a few things, as a likely autistic person myself, but definitely neurodiverse in one way or another. While it is a huge problem that there are people who jump from “vaccines aren’t amazing” to “you hate autistic people,” there are very real problems with the some of the “natural cures” that are given for autistic kids, hurting or sometimes even killing them. A big problem in society is that it seems like people just assume autism goes away after adulthood. Now, for whatever reason, people who were children when autism was finally accepted as a diagnosis are growing up, with the same problems, and for the first time, are able to speak out about what they’ve gone through and still are. – Many of us have suffered abuse as children at the hands of caregivers who didn’t understand what was going on with us and tried hurt us or killed us trying to “discipline” for our bad behaviors or cure us. – Many of us have suffered abuse as children from doctors, especially ABA practitioners, who are teaching obedience rather than coping skills as they think. – Many of us suffer every day, as adults because once we’re 18, we no longer are given any resources unless we qualify for disability. Most autistic adults don’t want to be cured. We never did. We just need to be taught coping skills for some things (executive function for one) and not to be shamed by society for the others (stimming for one). We prefer identity-first language because that is a part of who we are. The years of “person-first” language came at the behest of neurotypical doctors and sociologists, not us. – I’m forgetful and messy and terrible as a homemaker. – I still have meltdowns. – I don’t flap or rock anymore. Instead, I pick my nails and my skin and pull my hair. – I don’t understand social cues most of the time, even after studying them. – Traditional office jobs make me suicidal between the constant social contact and mental and physical demands. – I don’t talk if I can possibly avoid it. – But at the same time, I’m great at learning. Not in a college setting (due to the above), but I learn quickly and teach myself things because I love to. – My special interests are psychology, women’s health, computers, and self-improvement/spirituality. Fairly “normal” things, but I could talk to you for days about any one of those, if you’d let me. – I work from home doing web design and I’m trying to build a me-proof business based on my special interests. So, because I would present to you as a shy, introverted, a little eccentric woman, you wouldn’t know what I deal with internally as I go throughout my day. You don’t see me rocking and screaming because I release those feelings elsewhere and try not to melt down in public. I don’t always succeed. But all that to say that I, and many other autistic adults wouldn’t change my brain’s wiring for anything. We don’t want to be changed as children, we want to be supported. And those two things look very different from the outside. Personally, I have no problem with things that help support functioning – things like supplements to help me focus better, or to help my anxiety, systems to keep me on track with what needs done at any given time. But notice, those aren’t about curing me. It’s about supporting my needs while also working with them. I don’t function “normally”, and I don’t want to. I don’t think this was a vaccine injury for me. I don’t know, since my parents aren’t around to ask, and didn’t believe autism even existed as far as I remember, which is why I was never diagnosed as a child. No matter what, I don’t need “cured”. I wouldn’t be who I am today without the experiences autism brought me. Thanks for sharing, I have a nephew diagnosed with autism. My family knows without a doubt that the vaccines were the cause. This was before I married into the family. So When the family was warning me and my mom being a nurse I decided to stick with what I knew at the time. Since then I decided to not vaccinate which still seems like a scary choice at times. Anyway, I appreciate the information and you differentiating Autism and neurological injury. I watched the documentary the truth on vaccines and that was informative as well. I did have my children tested for allergies against the metals typically found in vaccines it was very non-invasive we went to a NAET. Wow this blows my mind that some in our society have fallen to this level of completely illogical thinking . I had no idea. Thanks for the warning. I’m sure the sudden increase in adult onset allergies has nothing to do with the constant flu vaccine propaganda. Keep up the good work. This is in reply to J.S. J.S., thank you for sharing your story. I don’t think Kate is writing about people like you, who have the sort of lived experience you have. She is writing about people who have been diagnosed with severe, regressive autism. Really well said and written. It’s so frustrating when all these people attack anyone who doesn’t want to vaccinate with arguments such as “we all were vaccinated and nothing happened” and so on… while ignoring not only stories of parents whose kids were injured due the vaccination but also all the data that exists plus logics of basic biochemistry (for samples how can one think that injecting mercury or aluminium into baby has no consequences?). Sometimes I cannot belive how many inteligent people choses to be blind… how they don’t even question vaccination . Every single drug has the side effects but not vaccinations??? My issue is, I have Autism. But am not vaccinated due to immune issues… So what about me? Why did I develop it? I am high functioning, but have definite issues caused by my autism. I won’t go into it, but I 100% have a neurodiversity illness without a shadow of a doubt. Neurodiversity definitely exists! And I am not saying it isn’t totally impossible that vaccines could cause this, but in my case they clearly didn’t. I personally don’t think vaccines are the cause of ‘autism’… but at the same time, I also don’t think ‘autism’ is a very descriptive condition at all. Everyone is so different, it is probably a couple hundred disorders all rolled into one umbrella term! So what I am thinking is perhaps… vaccines can cause brain injury. They just describe this as autism because it is just easier for them than describing a new condition? And then people like me are discreditted constantly for not being ‘autistic enough’. Like why are all autistic people so different, if it is all one disease?